Bedrock is run entirely by volunteers, with a combined aim of helping relieve the effects of pain and illness and help with their rehabilitation. Hospital radio is an exciting place to develop communication skills & enjoy the challenges of meeting new people & fundraising. All we ask is that you can help us fulfil our objectives. 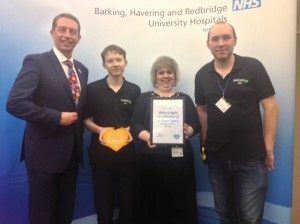 We provide a community broadcasting service that focuses on health and well-being for people living and around the London Boroughs of Havering, Barking and Dagenham, and Redbridge. We aim to provide relief of sickness, poor health and old age amongst patients in Queen’s, King George & Goodmayes Hospitals, plus out reach to residential homes and similar institutions, and for patients receiving community care. Working within our community to promote the benefits of living a healthy lifestyle, and the importance of maintaining a good personal mental and physical health. helping make our community a better, safer and healthier place to be. You will receive all the training you need to become an integral part of the hospital radio team. We DO NOT offer work experience placements of any kind. Due to not having regular members of staff on-site during the daytime, our hours of operation are unsuitable for the bodies that issue work experience placements. However, you could volunteer with us more long-term to help develop your skills. Interested in Volunteering at Bedrock Radio? Complete the form below, and we’ll be in touch. Why do you want to member of Bedrock Radio? What do you wish to gain from volunteering? How will you help us achieve our charitable objectives? How did you hear about Bedrock Radio? All Volunteers MUST undergo a Disclosure & Barring Service (DBS) Check, plus an Occupational Health Clearance this is a requirement of BHRUT & NELFT. Full membership of the CIO is subject to a membership fee. None of our Volunteers are paid, including Trustees. Successful Applicants will be invited in for interviews and training sessions. Failure to attended these without notice may result in termination of membership to the CIO.